Excellent accueil même si je suis arrivée en plein milieu de la nuit !!!! Merci beaucoup ! Perfect hostel, very cosy and comfortable. Very clean, good breakfast and nice staff. 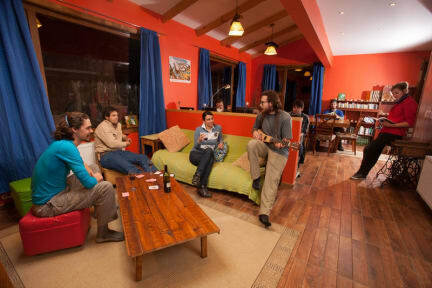 One of the best hostel in South America for sure. Auberge que je recommande à 100%. 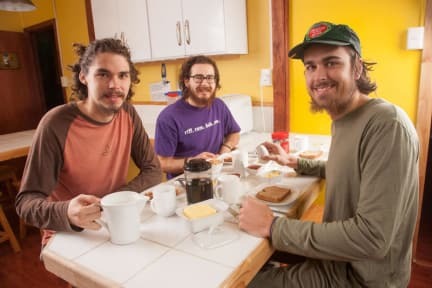 Propre, nous avons dormi en dortoir, le petit dej est parfait, l'ambiance est chaleureuse, on retrouve l'esprit refuge de montagne. We really enjoyed the nights we spent at Singing Lamb. Staff is very helpful, we got plenty of useful information for our trek in Torres del Paine. Kitchen is nice, showers are clean, bed are comfortable. It is very comfy to have such a place to stay before and even more after trekking. We were also able to do the laundry and leave our stuffs in a locker (charged for both). We also received a voucher for a free drink in their bar where atmosphere is nice! Definitely recommended. Very clean and comfy hostel. I had the chance to book a 6-bed room and finally sleep alone as it was the low season. The staff was welcoming, kind and helpful. Breakfast was a bit limited but as in every hostel so I would definitely recommend staying there. Great hostel! Would recommend the room of 6 rather than the one of 8, it's much better! (Better rooms, better bathrooms, more space, etc...). Altogether, very comfortable hostel, 2 towels are included (a small and a large) which is a first in 6 months of travelling! The breakfast was very good also! The location is a bit out of the center but Puerto Natales is not a big city so it's fine. Super nice place. Wonderful, friendly staff. Good and clean hostel generally speaking. Quite pricy for the value but in line with what you find in Puerto Natales. Bad point: the bathrooms for the dorms are too small for the number of guests and should be renovated.